UniFirst cleaning and wiping cloths are uniquely designed for the tasks at hand. and inventory management services ensure you always have fresh, high-quality cleaning cloths on hand when you need them. And when the job requires highly absorbent cleaning cloths, disposables simply can't measure up. Our reusable industrial cleaning cloths, shop towels, terry cloths, and wipers are made of natural fibers for enhanced absorbency to stand up to the toughest cleaning tasks. And our versatile microfiber wipers and dusters are excellent for lint-free cleaning on a variety of hard surfaces. They come in assorted colors for task-specific identification and to help prevent cross contamination. Complete your cleaning tasks more efficiently and leave the delivery, pickup, laundering, and inventory to UniFirst. Because we hygienically launder our reusable wiping products, they don’t end up in landfills, making them an environmentally friendly and economical alternative to non-woven disposables. UniFirst cleaning cloths are ideal for use by automotive shops, manufacturers, food processors, supermarkets, convenience stores, hotels, health and fitness clubs, and other businesses. 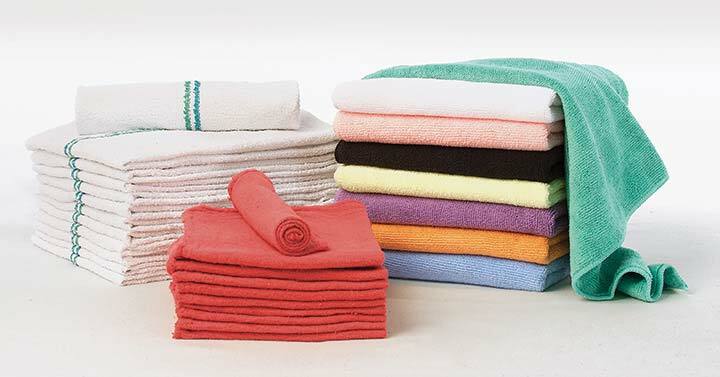 See our shop towels and wipes collection online in the UniFirst Facility Service Programs Catalog to shop our complete line of wiping rags and related cleanliness products. Start UniFirst cleaning cloth services today. Call (800) 455-7654. Browse our online catalog and choose from a wide selection of cleaning products. Conveniently customize a shop towels or wipes service quote for your company.